What’s the worst thing about going on a trip? Packing! We book it, we pay for it, we buy the guide books, and swoon over image searches of the beaches. But when it comes to it, planning what to pack, and making it happen is enough to tip a harrassed parent over the edge before they’ve even made it to the cocktail on the other side. The stress begins long before we hit the airport too, with endless lists dotted around the house, and scribbled reminders for just one more thing we thought of before we went to sleep, that needs to be purchased. But we have found a really rather nifty solution. All your holiday travel essentials in one shop. Chemist Direct are a GPhC-registered and regulated pharmacy offering top brands and favourite products at competitive prices. 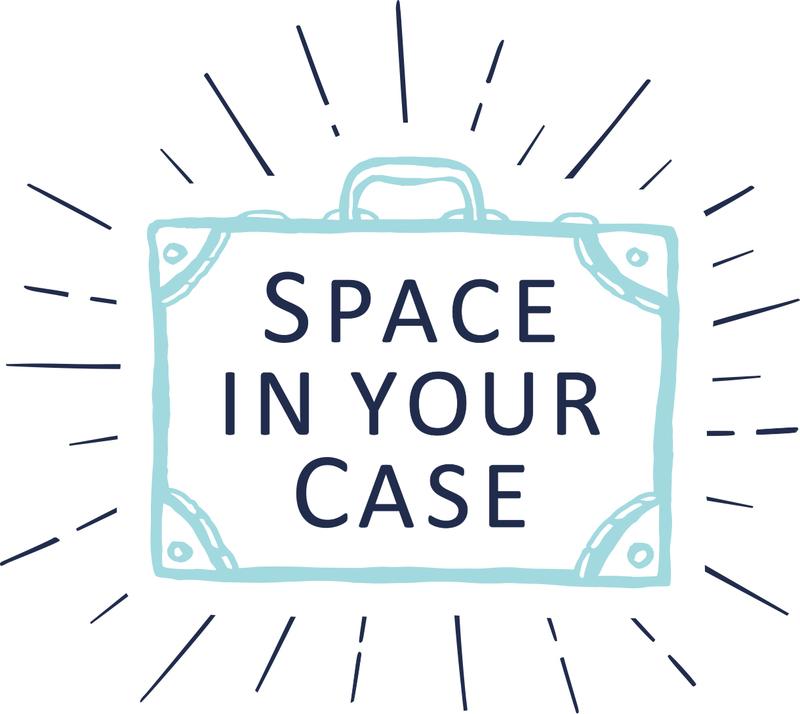 With sunscreen being so pricey – and yet essential to any family holiday in the sun – good price deals really appeal to us at Space In Your Case. We checked out their range to see if we really could get all our holiday travel essentials in one basket. We found no fewer than 22 brands of sunscreen, including all the favourites, and some from brands we might more often associate with skin conditions such as eczema. If you have a child with allergies, you might find some suncare brands to suit them better than your usual purchases. We also discovered P20, a once-a-day application product, which we’re hoping will minimise the suncream battles we wrote about recently! With plenty of buy-one-get-one-free deals it was easy to find something to suit our particular needs. While she was there, Helen also discovered a genius product for preventing the red parting she and her daughter sported recently in Barbados. We take care of our skin, but how often do we remember that hair and scalps also burn? Aftersun, deoderants, shaving products, dental care and all your usual toiletries are under one roof too, including handy travel-sized items to make your baggage allowance and boot space stretch further. If you’ve ever been bitten by mosquitos, you’ll know how maddening that can be, especially for little ones, so we stocked up on insect repellant thats kind to young skin, as well as an After-Bite pen, just in case. Chemist Direct also sell all the usual over-the-counter medicines, vitamins and minerals, so it’s a good time to find a great deal on your usual medicine-cabinet supplies. They can even fill your NHS and private prescriptions for you, saving a visit to the pharmacist, and ensuring that you have everything you need for a safe and healthy trip. Delivery is fast too – our order was delivered within 3 working days. So now all we need is a plan for our next trip! 2 One winner will win a £50 spend at Chemist Direct. The prize is non-transferable, non-refundable and there is no cash alternative. 3. The prize draw starts at 12.01am GMT on Wednesday 3rd June 2015 and closes at 11.59pm GMT on Tuesday 16th June 2015. 4. Entry is free and must be made by commenting on this blog post answering: ‘What holiday travel essential on Chemist Direct wouldn’t you leave home without?’ Bonus entries can be obtained by tweeting about the giveaway, visiting Chemist Direct on Facebook, visiting Space In Your Case on Facebook, following Chemist Direct on Twitter, and following Space In Your Case on Twitter. You can find Chemist Direct on Twitter and on Facebook. *Disclosure: Helen was given £50 to spend at Chemist Direct, in order to review their services. I wouldn’t want to be without Tepe Interdental brushes, so much better than floss! Blister Plasters – all that walking round ruins! Jungle Formula! don’t leave home without it!! These are always useful for the family for any scrapes etc http://www.chemistdirect.co.uk/steroplast-first-aid-kit/prd-4fp. I’d also get some suncream. With three children I always travel with a mini pharmacy! I would get suncream, plasters, wipes, handwash, lip balm and dettol!!! Sudocream – travel sized for my baby and for any little skin problem for the rest of the family. Mosquito spray, headache tablets and a good suncream. Imodium Capsules in case of holiday tummy! sun screen and diarrhoea treatments! P20! It’s the best sun cream for my skin and the only cream I’ve found that doesn’t let me burn at all – even in the hottest of weather! Don’t go on holiday without the Right Guard Xtreme Fresh 72hr Anti-Perspirant Deodorant! Factor 50+ suncream! There’s little joy in being fair in the sun without it! Sun Cream – I burn all too easily! These sanitising wipes look handy for all sorts of things when travelling. Most other items I would be confident of obtaining locally if necessary. Deodorant,shower gel and Jungle Formula insect repellent. I could not be without blister plasters if I am going to get a blister you can be sure its when I’m on holiday! I always have some P20 with me. cannot go without jungle formula repellent…….the mosquito’s love me!! Sun cream and after sun. Insect repellent is a must. It has to be P20 sunscreen. I have fair skin and I can put this on in the morning and it lasts all day. I still get a touch of colour without burning, which is great. Always sun cream – I hate getting burnt! Suncream, plasters, paracetamol and calpol! Def.BITE CREAN – Those Dam Mozzies LOVE ME! Nivea Factor 50 sun lotion! Sun cream is a must . Baby Wipes – an essential! http://www.chemistdirect.co.uk/steroplast-first-aid-kit/prd-4fp I wouldn’t holiday without a First Aid Kit. You’ve got to keep safe away from home too! Probably crazy to most people but since my holiday is in the winter, I don’t need sun cream. But new toothbrush, good toothpaste and mouthwash are essentials! After Bite Fast Relief for Bites & Stings – I buy this every year! 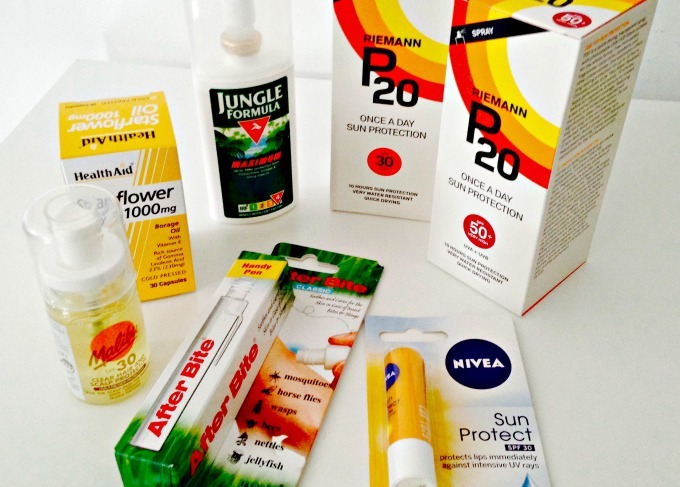 Suncream – it’s a nightmare buying for my family, they all want a different one! sun lotion – i burn at the slightest hint of sun! Sun cream and after sun! Suncream but of course plasters. Can’t be doing with those sneaky blisters ruining my day. I cant go on holiday without my sunscreen. The Riemann P20 Sun protection would be my number one requirement (as my skin burns so easily). It would be Dove deodorant, Corsodyl Daily Gum & Tooth Paste, Radox Coconut Kiss Shower Cream and Regener8 Moroccan Argan Oil Hair Serum. all the travel size bottles as I’m such a sucker for them! Theye Travel Micro SPF30 Sunscreen Spray + Mosquito Repellent Spray best of both worlds. I’d be stocking up on Piz Buin One Day Long Lotion F30 for our holidays. It’s the one I always turn to for all the family. It would have to be suncream. I have a toddler and burn easily, so sun cream is a must. Sunscreen, Antibac hand wash and Evian spray! This stuff is the bees knees, love it! The antibacterial hand pump, for me is essential! aloe vera gel! So soothing after being in the sun! I’ve learnt that I have to protect my lips – something easily forgotten, so he Nivea Lip Care Sun SPF30 Sun Protect is now a must. Suncream, decent hair conditioner and a spritz spray for my hair! Suncream and paracetamol. A hangover isn’t going to ruin my hols! I will not be going away unless I have suncream and lip balm. A must. Thank you. Centrum vitamins to boost my immune system as it seems I always get ill as soon as I relax! The Riemann P20 OAD Sun Filter SPF50+ & The Malibu Scalp Protector SPF30 are top of my list. sun cream and aftersun for when i burn!! a bottle of factor 50! VO5 Revive 2 in 1 shampoo and conditioner as I never like those in the hotel room! I always carry tea tree oil for insect bits and lavender oil for burns. Wet Ones Sticky Fingers Travel Pack. definitely AFTER BITE … I am the McDonalds of the mosquito world ! Mossie cream, P20 (best cream ever) wipes, aloe vera handcream. ZOVIRAX cold sore cream everytime i go abroad i need to smother my lips with this to avoid the dreaded cold sore! Jungle insect repellent for me. I always get eaten alive! Sunscreen but also, gulp, after sun. I never LEARN. Andrex Washlets Flushable Toilet Tissue for the bad seaside loos. Suncream, ibuprofen and throat syrup just in case there’s karaoke! Slow release vitamin c to keep the lurgies at bay. After bite – I always need this as get bitten so much. Dove cream bars, Radox muscle soak, Original source showel gel, xenical capsules. Some decent factor 50 sun cream for my daughters – http://www.chemistdirect.co.uk/banana-boat-kids-ultramist-spray-lotion-spf50/prd-ujn.